ABOVE: The experimental beach forecast gathers pertinent information on one page. In the map above, grey, yellow and red signify low, moderate and high risk for rip currents, respectively. Image courtesy National Weather Service. Note to Editors: North Carolina Sea Grant offers a special thanks to our media partners who regularly share safety messages regarding rip currents and other beach hazards. We hope you will bookmark this posting for quick reference during the beach season. This summer, the National Weather Service offers information about North Carolina beaches at a glance. Go to www.weather.gov/beach and click on umbrella icons along the state’s coast to get detailed updates from NWS offices in Newport/Morehead City, Wilmington and Wakefield in Virginia. Other areas of the nation are included. “The beachgoer has access to all pertinent beach information on one page — rip current risk, UV index, water temperatures and weather conditions,” says Tom Lonka, an NWS meteorologist in Newport/Morehead City. 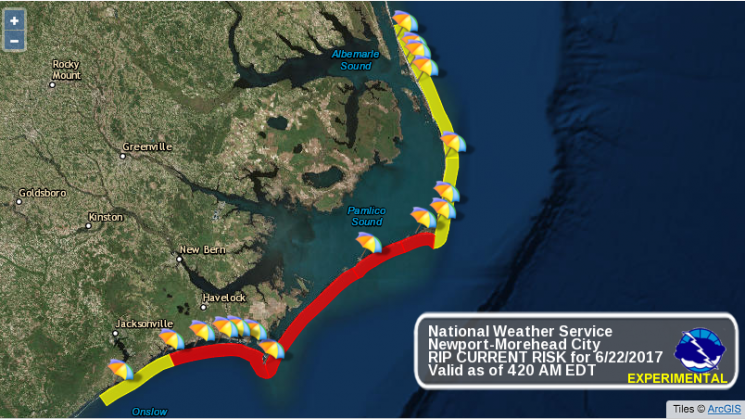 NWS offices serving North Carolina also provide daily postings of rip current risk during the beach season. Other information includes general beach safety, boating and lightning information, and common precautions. What if I’m Caught in a Rip Current? Click on the sign to print it and pack it in your beach bag. Stay calm. Rip currents don’t pull you under. Don’t swim against the current. Escape by swimming out of the current in a direction following the shoreline, or toward breaking waves, then at an angle towards the beach. If you need help, call and wave for assistance. These are just a few tips and resources to keep beachgoers safe from rip currents. Learn to swim. Swim near a lifeguard. Never swim alone. If you can’t swim, don’t go in. If in doubt, don’t go out. Assume there are rip currents at any surf beach. Click on the Rip Currents sign to learn what to do if caught in a rip current. Print it and pack it in your beach bag. Also look for a copy in the summer issue of Coastwatch magazine from North Carolina Sea Grant. Learn about the science of rip currents in this WTKF radio interview of Spencer Rogers, North Carolina Sea Grant’s coastal erosion specialist. Check out these YouTube videos on North Carolina Sea Grant rip current research, NOAA rip current survival, and/or NWS rip current safety. Visit North Carolina Sea Grant for more online resources for rip currents. Read this blog post on rip current safety partnerships along the N.C. coast. 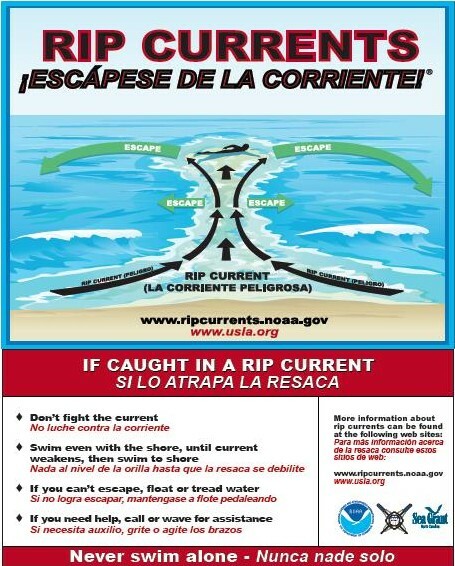 More information about rip currents can be found at www.ripcurrents.noaa.gov.